You better believe you can have chili for breakfast. 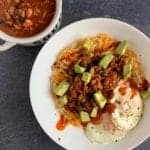 This breakfast chili is perfect over a bed of crispy hash browns with a bit of cheese and a side of fried eggs. If you’re unfamiliar with my recipes, my goal is to make things as simple as possible while still being healthyish. 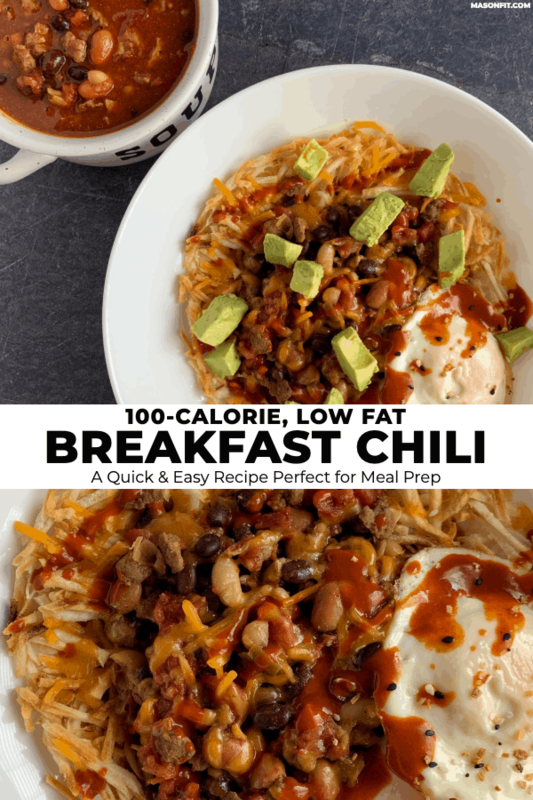 And with 100 calories per serving and a directions list that’s only two steps, this breakfast chili is a prime example of that. The ingredients for my take on breakfast chili are fairly similar to your typical chili, with the biggest difference being the protein sources. Instead of ground beef, this breakfast chili recipe calls for turkey breakfast sausage and bacon. Going back to my goal of simplicity, the recipe calls for precooked sausage and bacon. That way you can throw both straight in the pot and walk away. 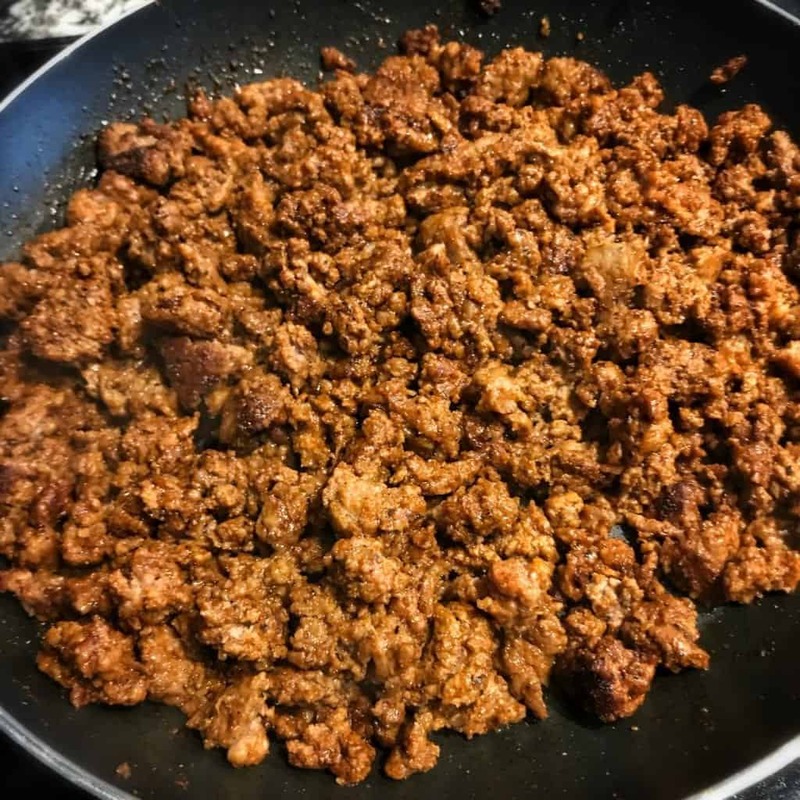 If you have trouble finding the turkey sausage crumbles or would rather use something fresh, the reduced fat pork sausage I use in my chorizo breakfast casserole would work great. If you opt for fresh pork sausage and bacon, I wouldn’t change anything else in the recipe—simply cook them in the pot first before adding everything else. And as one last ingredient note, feel free to swap the beans in and out to your liking. I took the easy route and air fried frozen hash browns for 10 minutes while I fried up a couple eggs. When the hash browns were crispy, I topped them with chili and shredded cheddar, air fried another minute or two to melt the cheese, and topped with the eggs and diced avocado. Bada bing. Bada boom. Breakfast chili is served. 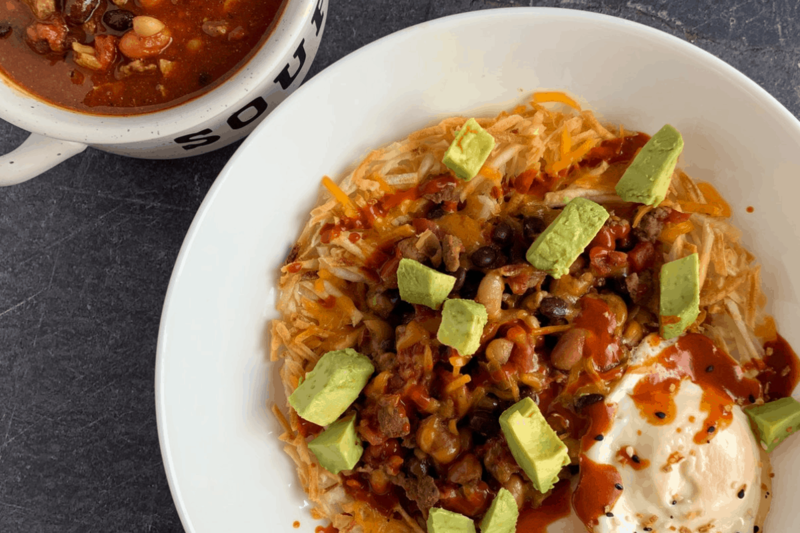 If you get creative with your pairings, I’d love to see your spin on this breakfast chili. Snap a pic and tag me on Instagram @mason_woodruff. Or you can join my free Facebook group and share it with the Proton Party. A simple recipe for a 100-calorie chili that's perfect over hash browns and fried eggs. Add everything, undrained, to a large pot over medium-high heat and bring to a slow boil, stirring occasionally. I recommend starting on the low end of the spice spectrum and adding to fit your spice preferences at the end. Reduce the heat to low and simmer for at least 30 minutes. Serve over pan or air fried hash browns with a bit of shredded cheddar and fried eggs, if desired. 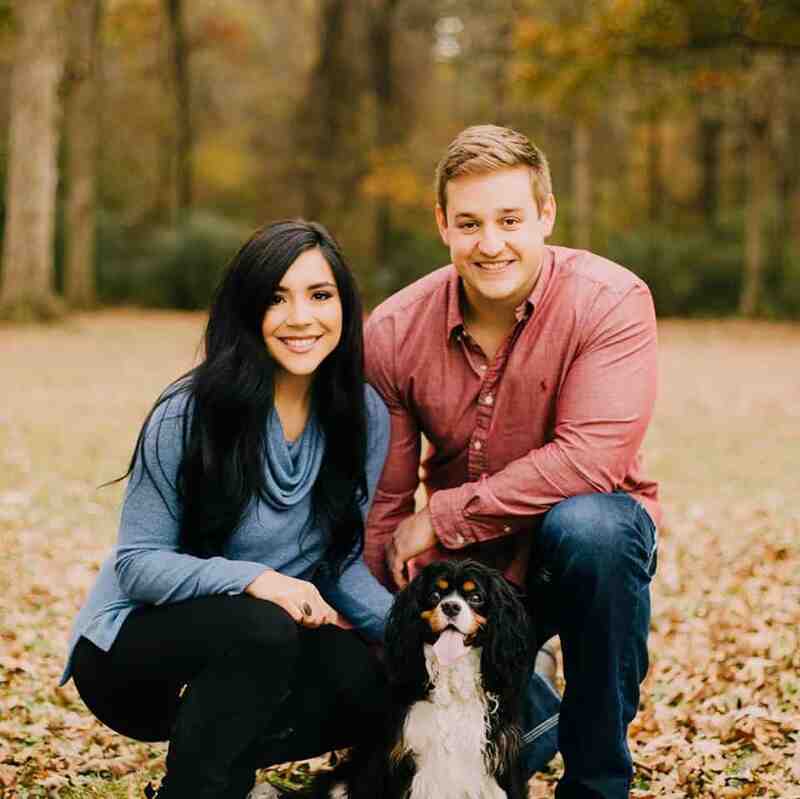 If you're using a crockpot, 2-3 hours on low should do it. For an Instant Pot, try 10 minutes on manual with a natural release. 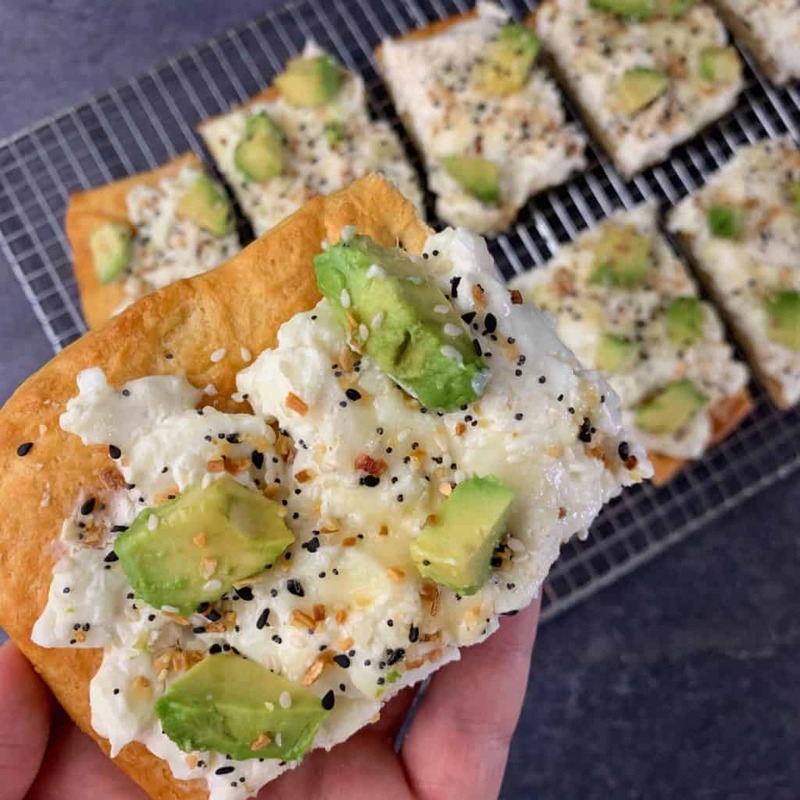 My Everything Bagel Crescent Roll Breakfast Pizza is perfect for breakfast meal prep or feeding the whole family on Sunday morning. 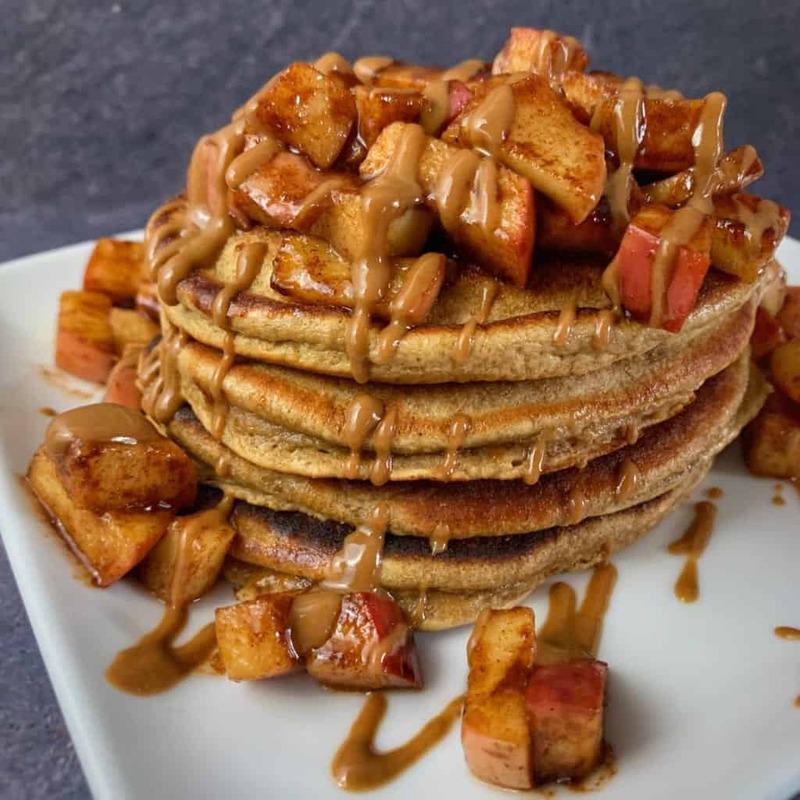 And my cookie butter protein powder pancakes with sautéed apples recipe is one of the tastiest you’ll come across. Tried this this morning! left out the mustard ( allergic) . I don’t have an air fryer, so I threw potatoes in my waffle maker to crisp them up- worked great! I also added fresh chopped tomatoes on top. I’d eat this for any meal, not just breakfast! High volume recipes are crucial when you’re ballin’ on a macro budget and this one is awesome. I top with some scrambled egg whites for a full meal and it’s spot on.